Jeffrey Gundlach of DoubleLine Capital just wrapped up his latest webcast updating investors on his Total Return Fund and outlining his views on the markets and the economy. Overall, Gundlach had a pretty downbeat view on how the Fed’s seemingly dead set path on raising interest rates would play out. 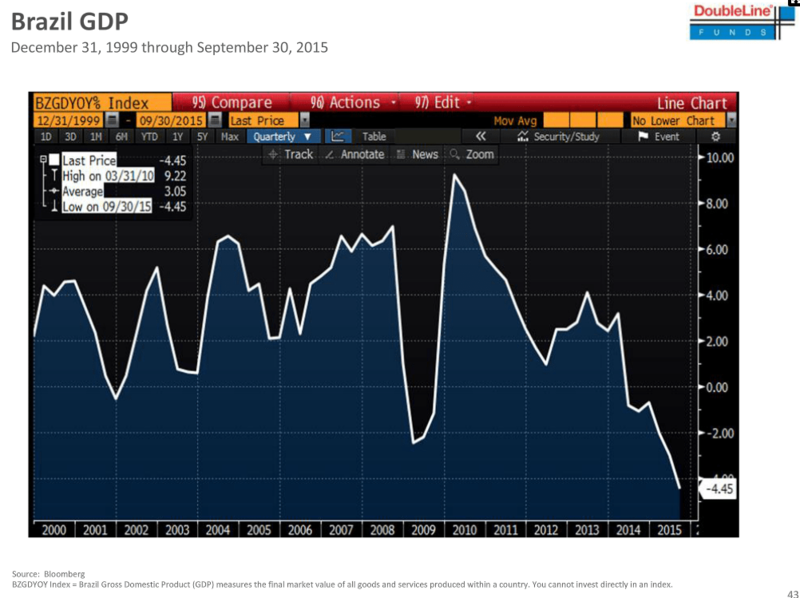 Gundlach expects the Fed will raise rates next week (probably!) but said that once interest rates start going up, everything changes for the market. Time and again, Gundlach emphasized that sooner than most people expect, once the Fed raises rates for the first time we’ll quickly move to talking about the next rate hike. As for specific assets, Gundlach was pretty downbeat on the junk bond markets and commodities, and thinks that if the Fed believe it has anything like an “all clear” signal to raise rates, it is mistaken. 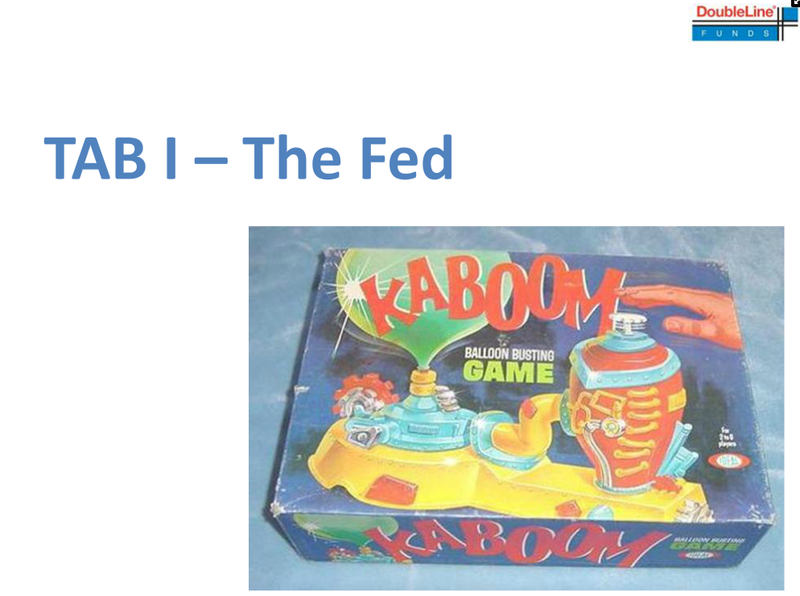 Gundlach said that the title, as you’d expect, is a reference to the markets waiting for the Federal Reserve’s next meeting, set for December 15-16. Right now, markets are basically expecting the Fed to raise rates for the first time in nine years. Gundlach says that the Fed “philosophically” wants to raise interest rates and will use “selectively back-tested evidence” to justify an increase in rates. Gundlach said that 100% of economists believe the Fed will raise rates and with the Bloomberg WIRP reading — which measures market expectations for interest rates — building in around an 80% chance of rates things look quite good for the Fed to move next week. Gundlach said that while US markets look okay, there are plenty of markets that are “falling apart.” He adds that what the Fed does from here is entirely dependent on what markets do. The increase in 3-month LIBOR is noted by Gundlach as a clear signal that markets are expecting the Fed to raise interest rates. Gundlach adds that he will be on CNBC about an hour before the Fed rate decision next Wednesday. 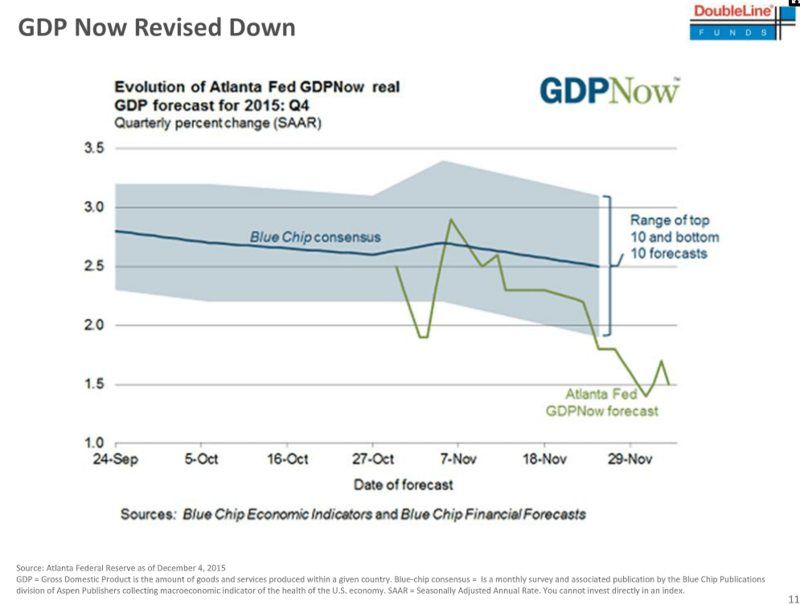 Gundlach notes that cumulative GDP since the last rate hike is about the same as past rate cycles but the pace of growth has been considerably slower than ahead of prior cycles because of how long we’ve had interest rates at 0%. The ISM survey is a “disaster” Gundlach says. Gundlach can’t understand why there is such a divide between central bank plans in the US and Europe, given that markets were hugely disappointed by a lack of a major increase in European QE last week while the markets expect the Fed will raise rates next week. 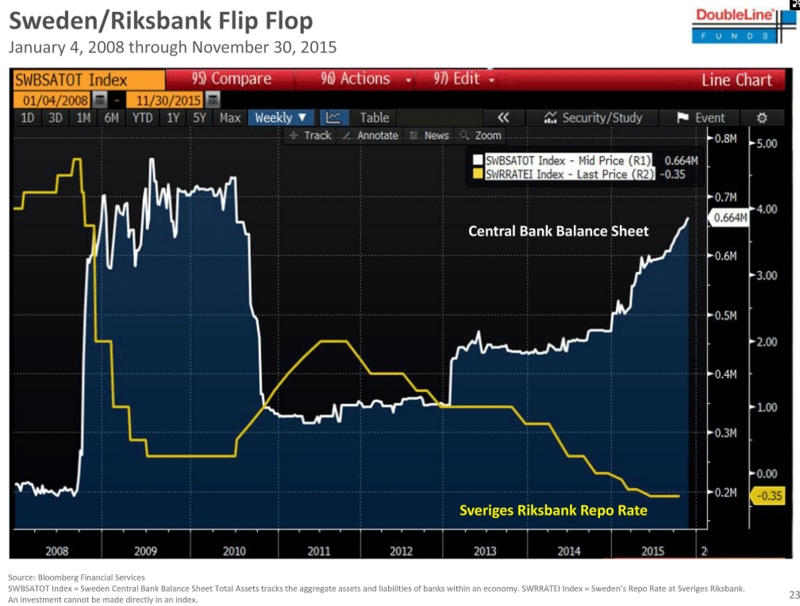 If the Fed hikes in December follow the patterns elsewhere, Gundlach thinks the Fed could looks like the Swedish Riksbank. 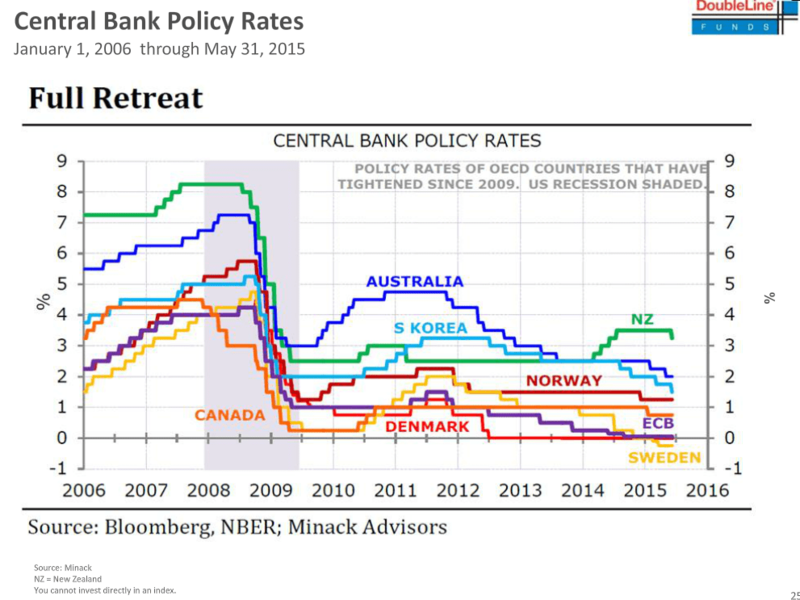 And the infamous chart of all central banks that haven’t made it far off the lower bound. 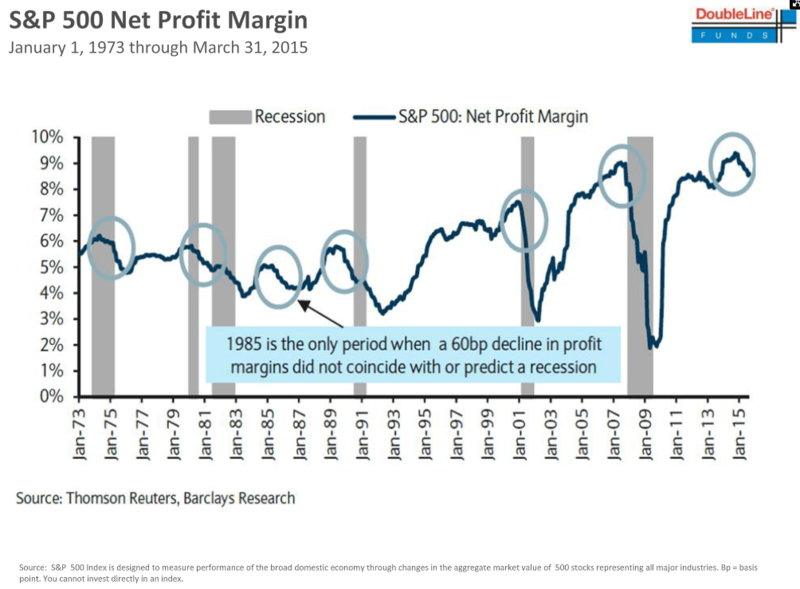 Gundlach again cites the decline in profit margins as a recession indicator, says it is still his favorite chart and one to look at if you want to stay up at night worrying. Gundlach said that while there are a number of excuses for why the drop in profit margins this time is because of, say, energy, he doesn’t like analysis that leaves out the bad things. “I’d love to do a client review where the only thing I talk about is the stuff that went up,” Gundlach said. On the junk bond front, Gundlach cites the performance of the “JNK” ETF which is down 6% this year, including the coupon. Gundlach said that looking at high-yield spreads, it would be “unthinkable” to raise interest rates in this environment. 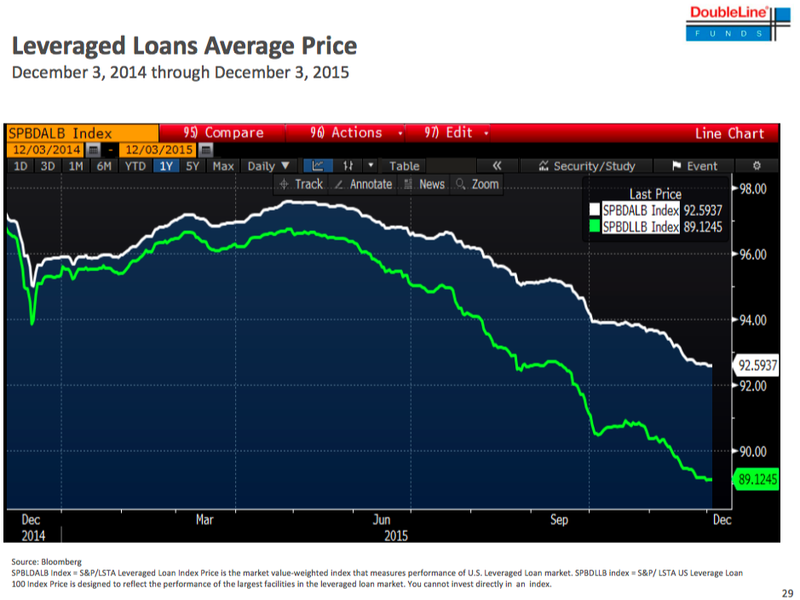 Looking at leveraged loans, which are floating rates, Gundlach notes these assets are down about 13% in just a few months. 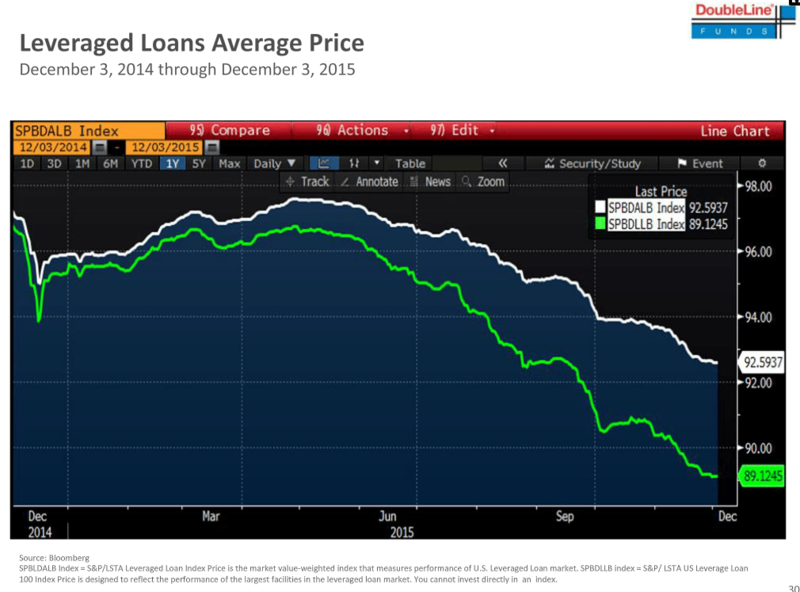 The S&P 100 leveraged loan index is down 10% over that period. “This is a little bit disconcerting, that we’re talking about raising interest rates with corporate credit tanking,” Gundlach said. Gundlach now wants to talk about the “debt bomb,” something he says he hasn’t talked about it a long time. 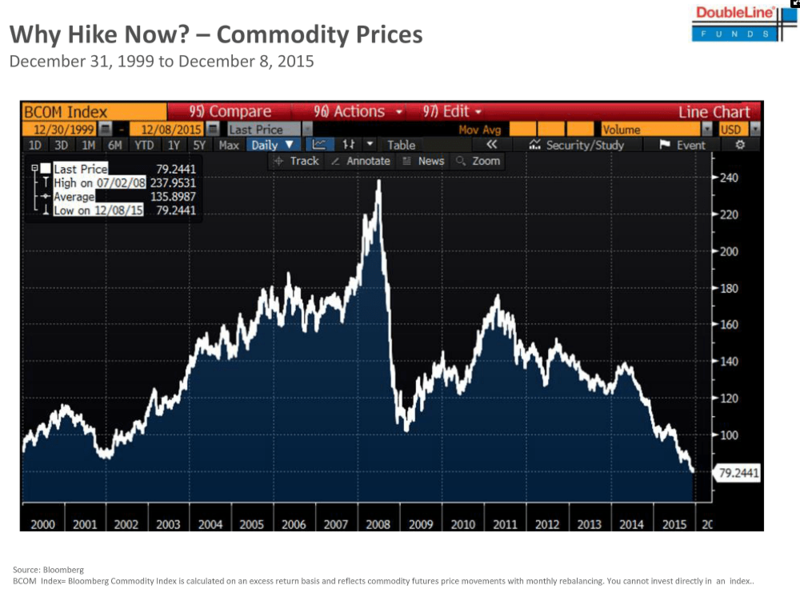 “The trap door falls out from underneath us in the years to come,” Gundlach said. 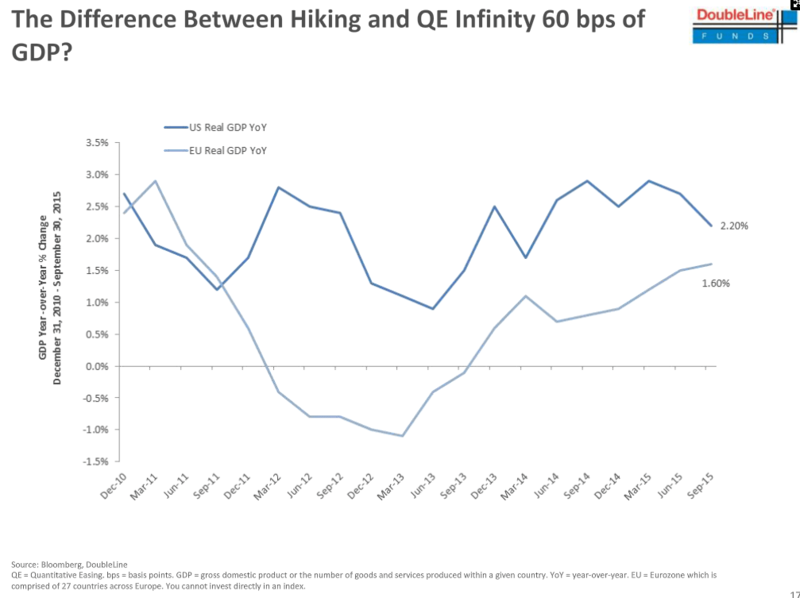 In Gundlach’s view, this “greatly underestimates” the extent of the problem. 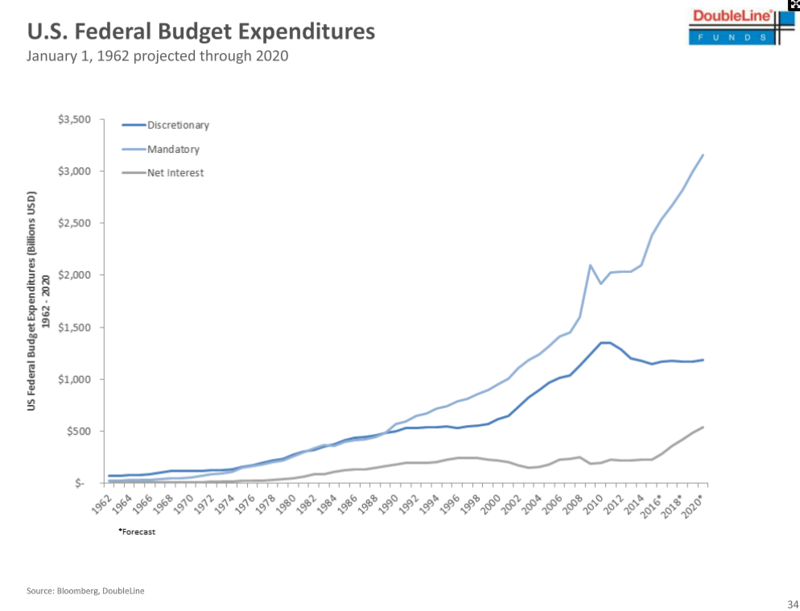 “I have a sneaking suspicion that defense spending could explode higher when a new administration takes office in about a year,” Gundlach said. 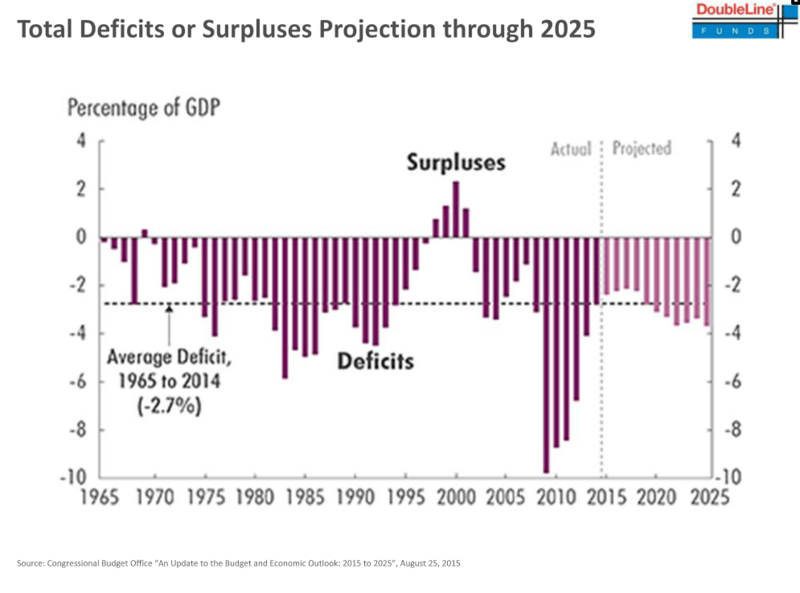 “I think the 2020 presidential election will be about what’s going on with the federal deficit,” Gundlach said. Gundlach now shifting gears to look at the rest of the world. Down 43% in a little over a year. Cites massive declines in copper and lumber, among other things. “It’s real simple: oil production is too high,” Gundlach said. 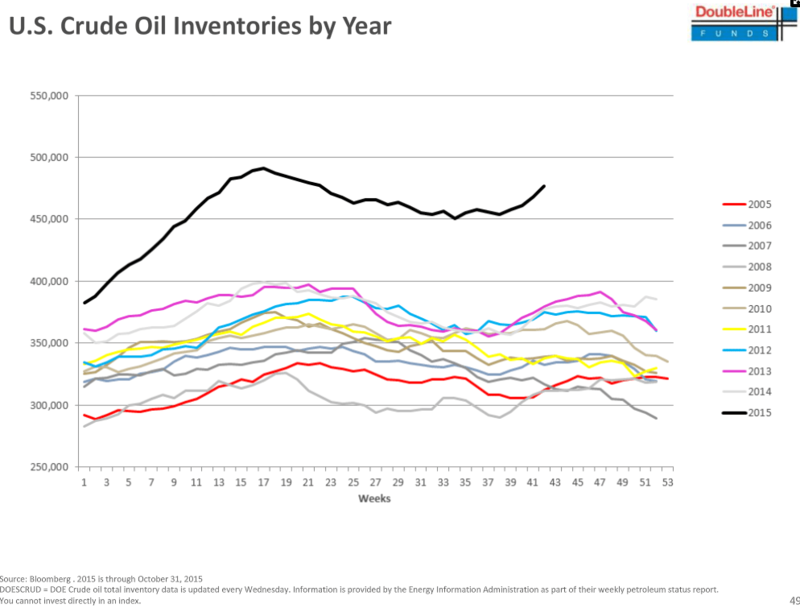 Gundlach calls this the “chart of the day” and wonders how you’ll get balance in the oil market with inventories up at these levels. Jeffrey Gundlach, CEO and CIO of DoubleLine Funds, has a simple warning for the young money managers who haven’t yet been through a rate-hike cycle from the Federal Reserve: It’s a new world. In his latest webcast updating investors on his DoubleLine Total Return bond fund on Tuesday night, Gundlach, the so-called Bond King, said that he’s seen surveys indicating two-thirds of money managers now haven’t been through a rate-hiking cycle. And these folks are in for a surprise. 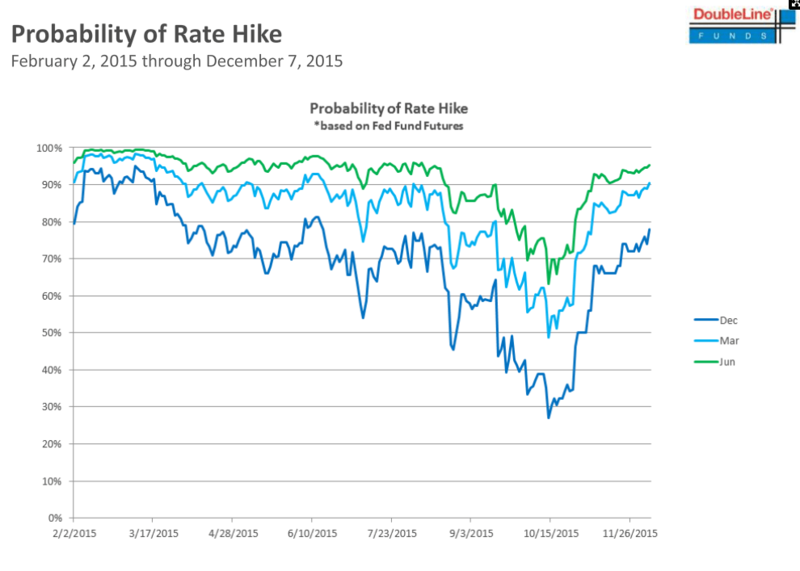 Currently, markets widely expect the Fed will raise rates when it announces its latest policy decision on Wednesday. The Fed has had rates pegged near 0% since December 2008, and hasn’t actually raised rates since June 2006. According to data from Bloomberg cited by Gundlach on Tuesday, markets are pricing in about an 80% chance the Fed raises rates on Wednesday. Gundlach added that at least one survey he saw recently had 100% of economists calling for a Fed rate hike. The overall tone of Gundlach’s call indicated that while he believes it’s likely the Fed does pull the trigger, the “all clear” the Fed seems to think it has from markets and the economy to begin tightening financial conditions is not, in fact, in place. In his presentation, Gundlach cited two financial readings that were particularly troubling: junk bonds and leveraged loans. 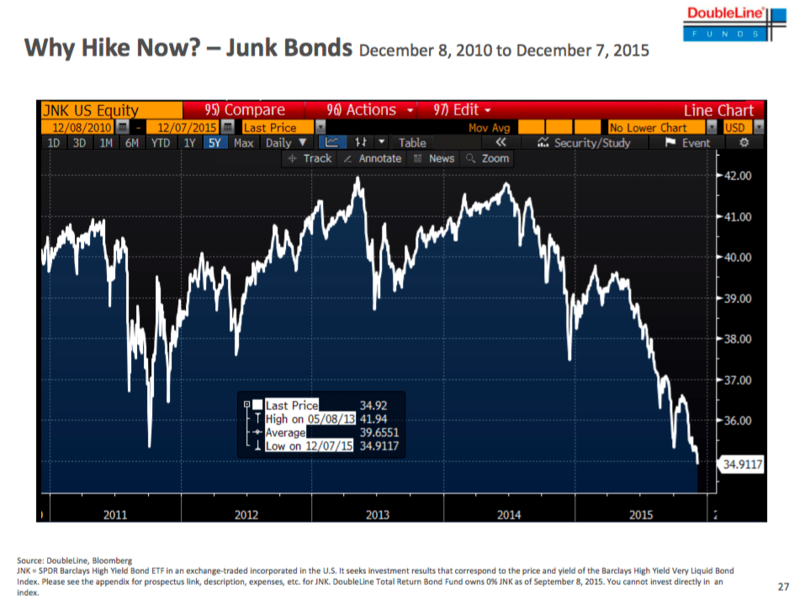 Junk bonds, as measured by the “JNK” exchange-traded fund which tracks that asset class, is down about 6% this year, including the coupon — or regular interest payment paid to the fund by the bonds in the portfolio. Meanwhile, leveraged loan indexes — which tracks debt taken on by the lowest-quality corporate borrowers — have collapsed in the last few months, indicating real stress in corporate credit markets. Gundlach was also asked in the Q&A that followed his presentation about comments from this same call a year ago that indicated his view that if crude oil fell to $40 a barrel, then there would be a major problem in the world. On Tuesday, West Texas Intermediate crude oil, the US benchmark, fell below $37 a barrel for the first time in over six years. The implication with Gundlach’s December 2014 call is that not only would there be financial stress with oil at $40 a barrel, but geopolitical tensions as well. Gundlach noted that while junk bonds and leveraged loans are a reflection of the stress in oil and commodity markets, this doesn’t mean these impacts can just be netted out, as some seem quick to do. These are the factors markets are taking their lead from. This entry was posted in Bonds, Economy, Mortgage, Uncategorized and tagged DoubleLine Capital, Fed, Federal Reserve, Gundlach, interest rates, Jeffrey Gundlach on December 8, 2015 by Bone Fish.